Marc, who runs the Astros-centric blog Remember the Astrodome, offered to send me a couple of baseball cards from my wantlists last week. 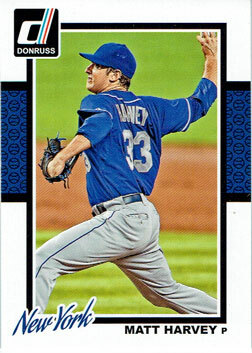 In return, I knocked a bunch of cards off of his 1980s Astros wantlists. Until I opened Marc’s envelope, I’d forgotten that I never finished this year’s Topps Heritage Mets team set… only nine more regular cards and three shortprints to go. 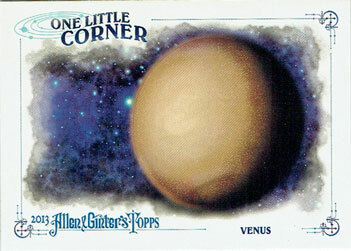 I’m a little closer to finishing the “One Little Corner” insert set from last year’s Allen & Ginter release. Only nine cards to go there. 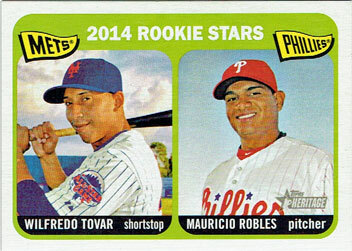 It’s no secret that I’m not a fan of Panini’s baseball cards, but it looks like I’m collecting their 2014 Donruss set. Marc sent me Matt Harvey and Travis d’Arnaud‘s cards, Geof sent me Wilmer Flores‘ card last month and I’ve got Curtis Granderson‘s card on the way in a Listia lot. 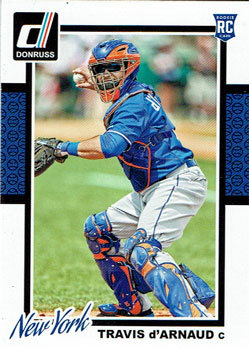 I suppose I should try to figure out how many more “Mets” cards there are. 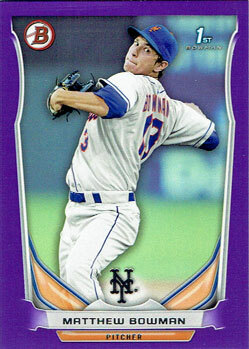 I did remember that I’m still working on the 2014 Bowman Mets team set, and I’m kind of tempted to count this purple-bordered parallel Matt Bowman card toward my goal if I don’t end up with the regular version.“Only” 14 to go, though a few of those should be coming in that Listia lot. Unlike the actual Mets, Bowman is in the playoffs. Unfortunately, he had a rough night on Thursday when he allowed six runs over four innings as the Las Vegas 51s lost 6-0 to the Reno Aces. Thanks for the trade, Marc!